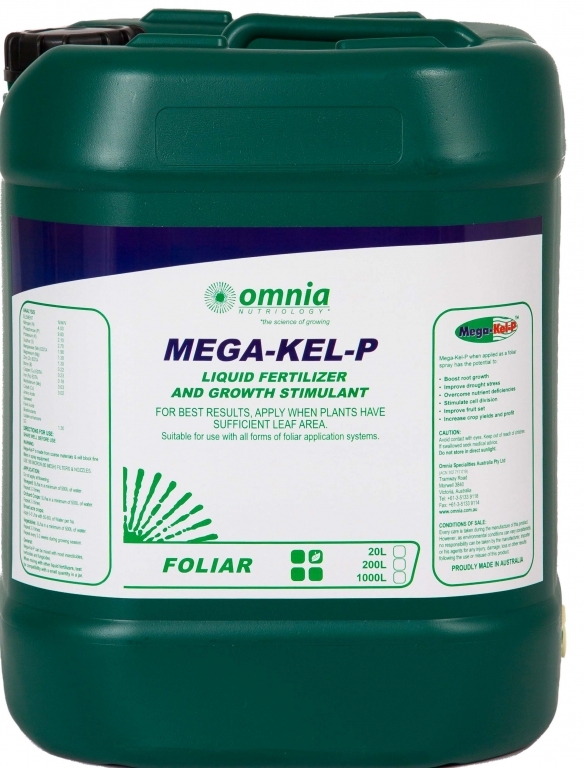 Mega-Kel-P is a specifically designed stress-management foliar which is unsurpassed for rapid crop recovery after environmental stress events such as waterlogging, heat stress, transplant shock etc. As well as stress management Mega-Kel-P has become Omnia’s most successful and sought after foliar product for rapid, high level root stimulation, fruit retention, fruit sizing and as a general foliar to help crops perform over and above the norm. Mega-Kel-P results in better, stronger and healthier crops with improved yields and shelf life by improving the plants ability to assimilate and utilise minerals and nutrients as well as preconditioning prior to stress events which would otherwise cause far higher levels of crop loss. Mega-Kel-P is an organic based nutrient solution, high in phosphorus and nitrogen with essential chelated trace elements and amino acids in specific ratios required to kick start and enhance photosynthesis and production. It also contains natural growth hormones (cytokins and auxins) that stimulate cell division and elongation as well as high quality Fulvic Acid. 5L/ha in a minimum of 500L of water. Repeat 2-3 times. Repeat every 2-3 weeks during growing season.When mixing with other liquid fertilizers, test for compatibility with a small quantity in a jar.